The spare tire cover is one of the most overlooked accessories for your vehicle. These accessories come in soft leather, hard metal, and even vinyl. In the end, your spare tire cover makes sure your spare tire is ready when you need it. Even though you may never actually use your spare tire, your cover will ensure the replacement is always in good working order and your vehicle looks great. Continue reading to learn more about why a spare tire cover should be an included accessory for your automobile. 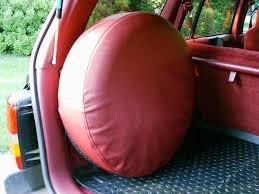 One of the main uses of your spare tire cover is to protect your tire from the harmful UV rays of the sun. If your tire is left out in the sun without protection, it will crack and shrivel. This means your tire will be rendered useless in the event of an emergency. These sun-dried and cracked tires will eventually deteriorate as the vehicle travels down the road, which can create another safety hazard. In addition to protecting your spare tire from the sun, a tire cover helps keep your spare tire clean. When your spare tire is clean, it will perform at a much higher level compared to a tire that is left out in the elements to fend for itself. In the end, a clean spare tire will provide a much nicer and smoother ride than the alternative. It's your vehicle and you deserve to make sure it looks as great as possible. Tire covers are one of the easiest ways to accessorize your vehicle and show off your personality. Whether it's your favorite team, a military cover, or a plain tire cover, tire covers offer you the opportunity to show off your style. At the same time, you can use a protective tire cover to coordinate with the colors of your vehicle. The tire cover possibilities are endless. In the end, a spare tire cover will help protect your "Ace in the hole" and make sure your spare tire is there when you need it. In addition, you can use your spare tire cover to further express your personality with your favorite NCAA Team (basketball, football, hockey) or just about anything else. For more information and great selection on car, truck, and SUV accessories, visit the Olympia Auto Mall serving Yelm and surrounding areas. For spare tires, they got you covered!